Low-grade myofibroblastic sarcoma (LGMS) represents an atypical tumor composed of myofibroblasts with a predilection for the head and neck, especially in the tongue and oral cavity., Myofibroblasts are mesenchymal spindle-shaped cells present in almost every soft tissue. LGMS usually occurs in adult patients with a slight male predominance. Children are rarely affected. Clinically, patients complain of a painless swelling or an enlarging mass. It is a slow growing neoplasm with a tendency to local recurrence and metastasis, even after a long period. The differential diagnosis includes both benign and malignant lesions such as nodular fasciitis, fibromatoses, fibrosarcoma and leiomyosarcoma., To the best of our knowledge, only 55 cases of low-grade myofibroblastic sarcoma have been reported. It is an uncommon clinic-pathological entity recently classified by World Health Organization (WHO) with very sparse knowledge available regarding its course, treatment options, and outcome. We report two rare cases of LGMS of head neck region along with its clinical, histological, inmunohistochemical and therapeutic features. A 35-year-old male patient was referred to our hospital for evaluation of a painless mass in the left maxillary sinus. The mass had appeared three months earlier. His personal and familial medical histories were unremarkable. Nasal examination showed smooth bulging of the left lateral nasal wall obscuring all landmarks. There was slight lateral and upwards proptosis of the left eye. CECT showed a homogenous mass in the left maxillary sinus with bone destruction in the orbital floor, lamina papyracea, and medial wall involvement [Figure 1]. He underwent endoscopic biopsy from the mass which showed diffuse proliferation of spindle-cells with rounded nuclei [Figure 2], small nucleolus surrounded by an intense lymphocytic infiltrate. On the basis of these clinical, radiological and histological findings, the patient was diagnosed with spindle cell sarcoma. The patient underwent under general anesthesia, a combined approach Endoscopic Sinus Surgery of left maxillary sinus, where tumor was removed through a modified extended medial maxillectomy approach. The mass was removed keeping all oncological principles in mind. Anterolateral wall, medial wall including lamina papyracea, part of orbital floor was removed. Histopathological examination revealed hyalinised fibrocollagenous tissue and scattered spindle shaped cells. The hypercellular areas showed interlacing fascicles of oval and spindle shaped cells with elongated plump nuclei. Tumor showed nuclear pleomorphism, mitotic figures (<2 mitosis/10 high-power field) with hemangiopericytomatous arrangement. The tumor cells express alpha-Smooth Muscle Actin, MIC-2 and are immunonegative for CD 34, Desmin, S-100 protein, Cytokeratin, EMA, Calponin and Bcl-2. Thus the diagnosis of Low Grade myofibroblastic sarcoma was made. The patient showed recurrence in the same site near orbital floor after 6 years of initial treatment. The patient was given chemotherapy for 6 cycles. After chemotherapy the patient is under strict follow up and had no signs of recurrence till now. A 38 year old female patient presented with ulceroproliferative mass of the right buccal mucosa for 3 months. She had history of tobacco chewing for last 10 years. Punch biopsy from the lesion was suggestive of soft tissue proliferation. She underwent wide local excision of the mass. During the intraoral surgery it was found that the mass had origin in the fibers of the buccinators muscle. Biopsy revealed spindle cell proliferation. These spindle cells were arranged in fascicles, with atypical round-spindle like nuclei, mitotic figures (10/10 high power field). Majority of spindle cells were positive for smooth muscle actin and MIC-2 and immunonegative for Desmin, s-100, cytokeratin. The tumor had recurred within two months of the initial procedure. She underwent chemotherapy for 6 cycles followed by wide excision with lip splitting incision. She is under strict follow-up and showed no signs of recurrence after 2 years. Myofibrosarcoma is a neoplasm composed of cells with differentiation towards myofibroblasts. Myofibroblasts are cells present in granulation tissue of healing wounds. It plays role in the production of contractile force. Low grade Myofibrosarcoma (LGMS) used to be a controversial neoplasm, but has been reclassified as a distinct pathological diagnosis of soft tissue tumor by 2013 World Health Organization (WHO) classification of Soft Tissue and Bone (fourth Edition). These tumors can easily be misdiagnosed as benign tumors like Nodular fasciitis, Myofibroma etc. Other tumors to be considered for differential diagnosis include monophasic synovial sarcoma, malignant peripheral nerve sheath tumor and spindle cell rhabdomyosarcoma. LGMS and inflammatory myofibroblastic tumor have similar features but LGMS is more malignant thus requires more aggressive surgical treatment in the form of more surgical margin and postoperative chemotherapy and radiotherapy. LGMS has a predilection for head and neck region especially oral cavity and tongue. Other sites are upper and lower extremities, abdomen and pelvic cavity. Though rare, LGMS of bones have also been reported in femur and iliac bones., The most common site of LGMS was tongue followed by mandible, neck, larynx, palate, maxilla and lips. LGMS of maxillary sinus and buccal mucosa has been documented in four and two cases respectively in world literature till date. In this case report, we describe LGMS arising from maxillary sinus and buccal mucosa and its treatment outcome. LGMS has been defined as distinct clinical entity only recently. It usually occurs in adults with slight prevalence in males, children are rarely affected. 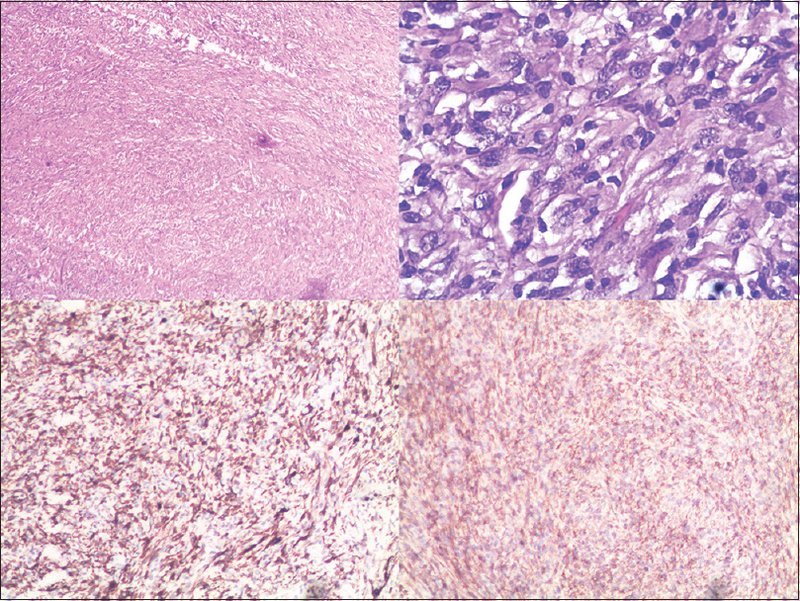 Histologically, this tumor composed of slender spindle cells with Eosinophilic cytoplasm and fusiform, tapering, wavy, ovoid nucleus with central Eosinophilic nucleoli. The tumor cells are arranged in strange fascicular pattern,, but seldom storiform pattern is also observed. Cellularity varies from one area to other. In the present case, hypocellular areas showed interlacing fascicles of oval and spindle shaped cells with elongated plump nuclei. Tumor showed nuclear polymorphism, mitotic figures with hemangiopericytomatous arrangement. Intracytoplasmic hyaline inclusion bodies of variable size, often located adjacent to the nucleus, were seen in numerous spindle and stellate cells. These inclusion bodies in this tumor cells were characteristically globular, randomly scattered clusters of fine filament usually adjacent to nucleus. Intracytoplasmic hyaline bodies were not found in both cases. Mitotic figures ranges from 2/10 to 20/10 (i.e. mitoses in 10 HPFs). Immunohistochemistry is very essential for exact pathological diagnosis. LGMS stained positively with at least one myogenic marker, mostly positive for Desmin, Alpha smooth muscle actin, Muscle specific actin, Fibronectin, Vimentine and Calponin., Different types of myogenic marker positivity are noticed. Even, positivity of different markers in a single tumor is noticed emphasizing the variable immunophenotype of myofibroblastic lesion. In our case, tumor cell expressed smooth muscle actin, MIC-2 but was negative for Desmin, S-100, Calponin etc. Electron microscopy shows cells with indented nuclei, small nucleoli, abundant rough endoplasmic reticulum, micropinocytic vesicles and longitudinally arranged fine filaments with focal electron dense patches. Although no consensus has been arrived about treatment of LGMS yet, but excision of the tumor with tumor free margin is essential. Occasionally radiotherapy, chemotherapy is the preferred therapeutic option. Radiotherapy relatively gives higher rate of recurrence, even according to Maruyama et al. radiotherapy should be avoided following resection as it may induce recurrence of LGMS. The recurrence rate of LGMS is about 25.45% and it is highest when tumor is sited in nasal cavity and paranasal sinuses. Recurrence rate is even higher when surgical excision was followed by radiotherapy (about 71.4%) than surgery alone (18.8%). LGMS lesions are local, aggressive and characterized by frequent recurrence, but exhibit a relatively indolent course, and tend to recur locally rather than metastasizing. Cases presented with distant metastasis have unfavorable prognosis. Low grade Myofibrosarcoma is a rare tumor of soft tissue and bones mostly seen in head neck region. These lesions have fairly indolent course, thus causing delay in diagnosis. Immunohistochemistry is essential for exact categorization of the tumor. Wide local excision with safe oncological margin is the mainstay treatment, postoperative radiotherapy or chemotherapy has no major role in treatment. Local recurrence even after many years of initial presentation is noticed rather than distant metastasis. Further research work should be taken to know the complete biological picture of the tumor. Mentzel T, Dry S, Katenkamp D, Fletcher CD. Low-grade myofibroblastic sarcoma: Analysis of 18 cases in the spectrum of myofibroblastic tumors. Am J Surg Pathol 1998;22:1228-38. Watanabe K, Ogura G, Tajino T, Hoshi N, Suzuki T. Myofibrosarcoma of the bone: A clinicopathologic study. Am J Surg Pathol 2001;25:1501-7. Meng GZ, Zhang HY, Bu H, Zhang XL, Pang ZG, Ke Q, et al. Myofibroblastic sarcomas: A clinicopathological study of 20 cases. Chin Med J Engl 2007;5:120:363-9. González-Cámpora R, Escudero AG, Ríos Martín JJ, ArmasPadrón JR, Vázquez AH, VázquezRamírez FJ. Myofibrosarcoma (low-grade myofibroblastic sarcoma) with intracytoplasmic hyaline (fibroma-like) inclusion bodies. Ultrastruct Pathol 2003;27:7-11. Mentzel T. Low grade myofibroblastic sarcoma. In: Fletcher CDM, Bridge JA, Hogendroorn P, Mertens F, editors. World Health Organization classification of Soft Tissue and Bone. 4th edition. Lyon: IARC Press; 2013. p. 85-6. Keller C. Low-grade myofibrosarcoma of the head and neck: Importance of surgical therapy. J Pediatr Hematol Oncol 2004;26:119-20. Niedzielska I, Janic T, Mrowiec B. Low-grade myofibroblastic sarcoma of the mandible: A case report. J Med Case Rep 2009;10:8458. Maruyama T, Nakasone T2, Nimura F1, Matayoshi A, Kawano T, Nishihara K, et al. Indolent growth of low-grade myofibroblastic sarcoma of the cheek mimics benign lesions: A case report and literature review. Oncol Lett 2017;13:4307-14. Yamada T, Yoshimura T, Kitamura N, Sasabe E, Ohno S, Yamamoto T. Low grade myofibroblastic sarcoma of the palate. Int J Oral Sci 2012;4:170-3.